Have a great weekend, Mary Lee! Wonderful poem and joyous pics. Thanks for the lift! Mary Lee, my father took me fishing once, and we caught nothing. We cast our lines, we squinted at the sunny lake, and we sat side by side. No fish story could be sweeter to me. Then I saw your pictures, and I had to laugh, especially at your descriptions. Love the poem and pix. A treat. And you make us cringe. Wow, Mary Lee - you are always so good at imbuing fun, "ordinary" moments with depth. Thank you. Great pix! Such joyous photos--they do my heart good, as does your "Ode." Your trip was a success in more ways than one! Connecting in these ways makes a heart sing, I'm sure. Your descriptions are wonderful, Mary Lee. Great pic and poem, glad the bluegill is out swimming free, thanks Mary Lee! I agree with Robyn--You have such a knack of finding the poetry in the moment. 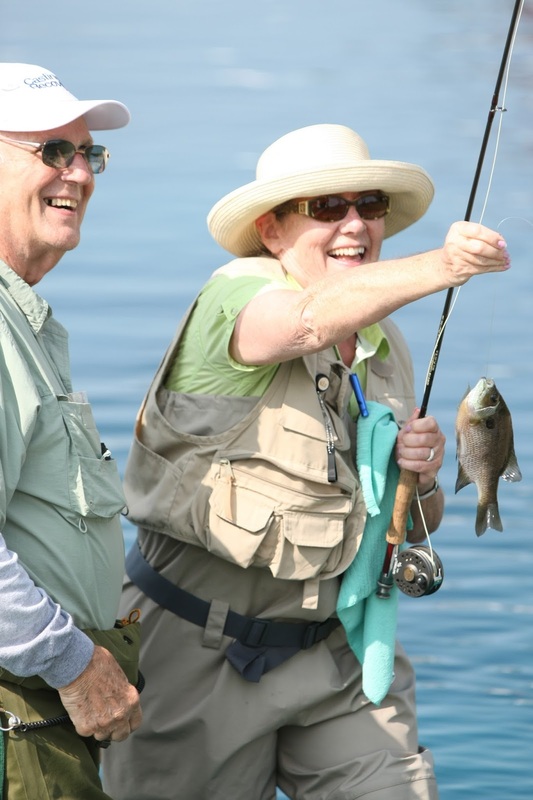 Your poem creates a tug as surely as the bluegill does. Wonderful! I have never felt that tug ... but fun to read about it. And love those smiles! Laura, I say -- If you found it, it was there. Thank you for digging deeply into my words! Mary Lee, your poem is marvelous! Your last line reminds me of my last line from a poem I shared last week, A Home for Peace. "So that one of us, is all of us." Thanks for sharing! I hope the weekend was as wonderful as your poem! Fly fishing is one of my favorite things, although I am terrible at it. You've caught the feel perfectly with your poem. Close reading reveals depth below the visible surface: recovery takes fighting like something ten times your size, a spiky dorsal fin, "recovered" is iridescent. Joyous and true. 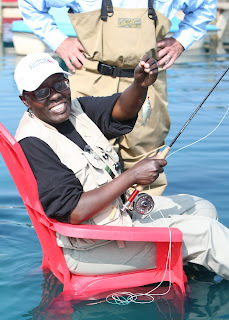 When I go fly fishing I want to sit in a red plastic chair! Such joyful images of wonderful in-the-water moments. And such precise words storytelling in poetry. Brava!